If you’re new visiting my blog, I’m doing a series of posts for my upcoming thirtieth birthday, which was two weeks ago. You can catch up by reading here, here and here. Ah…So, it’s taken a bit of motivation to finish up this series. It’s taken more time that I had anticipated to dig up old photos, outline the last thirty years chronologically, and pick out the things that I think are noteworthy enough to express important aspects of my life. Not to mention that the last few weeks have been really busy with Parker starting MMO, and Dan traveling non-stop (which means less alone time for me)…BUT, some of the best times have been in the past ten years, so this is definitely something that deserves to be documented. I pick back up where I left off, living with my Aunt Marie. I stopped working at the French bistro, dumped my aspiring rock star boyfriend, and moved on to a different job- waitress at TGI Fridays. I was attracted to the fancy flare uniforms with the cute suspenders. Maybe a little Jen Aniston from Office Space inspiration. From there, I made new friends who introduced me to the techno club scene in Midtown. Being twenty, and knowing someone who could let me party VIP style at the most popular clubs in Atlanta made me feel pretty freekin good. Pretty soon, I was going out almost every night spending the small amount of waitress tips that I should’ve been saving for an apartment, on clubs, pool halls, bars and partying. One night in particular, while out with co-workers shooting pool, per usual…I was drinking like a fish on a random week night. During one of my frequent bathroom visits, I found myself washing my hands in the sink, and I just looked up at the mirror and stared at myself...Uggggh…What am I doing? Am I getting buzzed AGAIN on a random week night? Is this really all I’ve become? I didn’t want this to be my life. I deserved better. With this epiphany, something began to tug at my heart. I was on the brink of change. I didn’t want to be a waitress forever. I wanted to go to college. I just didn’t know how, where and exactly what to major in. This became even more apparent when I was working as a waitress every day, getting crappy tips, and sweeping the dropped french fries and crumbs off the floor. So, the search began for a school and a major. I needed to go somewhere that was semi affordable since I wouldn’t have someone paying my entire way for me, and somewhere that didn’t need SAT scores, since I didn’t bother taking the test my senior year. I knew I wanted to do something artistic since Art class was the only thing I seemed to enjoy and excel at in school. After doing some research, and tour some schools and attending a few orientations, and I decided to apply to Bauder College, and major in their Interior Design program, which would allow me to get an Associates of Arts in Interior Design. My aunt Marie had such a beautifully designed home, and she that inspired me to get into design. I wanted to create incredible interiors and use my love of arts and nature to inspire unique design ideas. After submitting a portfolio, I was accepted into the program. I also got a small scholarship to help with the expense of the school. 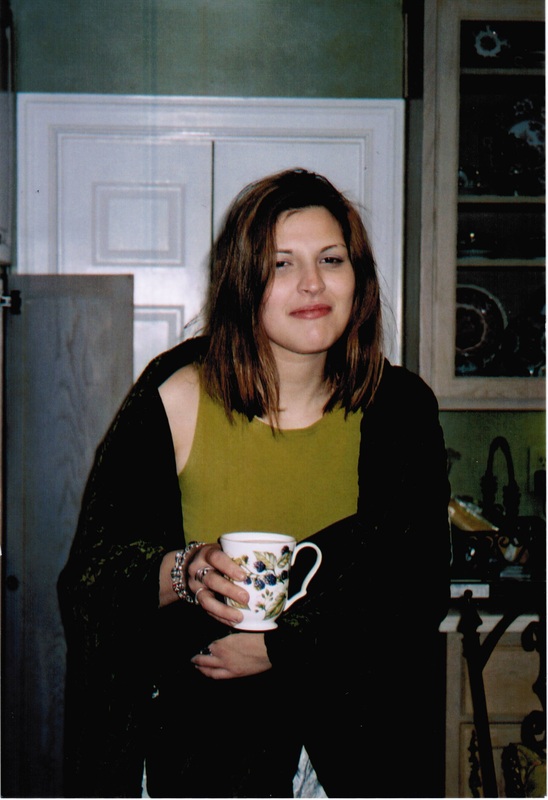 I quit my waitress job and took a job as a front desk clerk at LaQuinta Inns and Suites, which allowed me to go to school in the morning and then bring my homework to work and work a 3-11 shift. I also was able to save up enough moeny to move out from living with my Aunt Marie, and moved into my own apartment. This was a nice transition, and allowed me to feel more independent and become a responsible adult. School was also expensive. Rennie and Dad, My Aunt, and my grandparents helped pay money each month to allow me to go to school. In addition to that, I took out a student loan for the remainder. Since it was a private art school it was EXPENSIVE! School allowed me to straighten up my act a little bit and focus on what I wanted to do with my life. The last thing I wanted to do was screw up this incredible opportunity that so many people were helping me achieve. 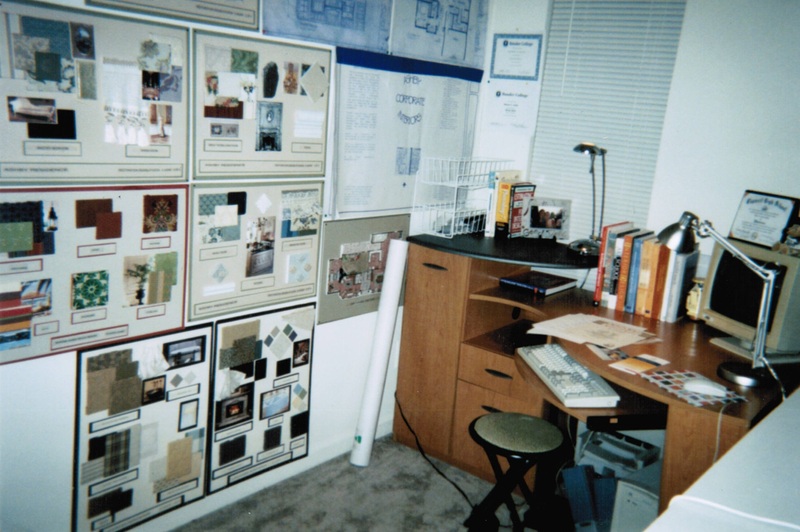 The picture to the left is what my “office” looked like in my apartment with my finish boards I created in school. I was twenty one, and ready to get serious about what I wanted to do with my life. I started going to church with my grandparents, determined to get my life back together. I quit smoking, drinking, and partying. I was done with that. I decided to lean on God, and let him take the reigns over my life. I obviously wasn’t doing a good job without him. I wasn’t prepared to have anymore close calls in without having God front and center in my life. I was 22, when I met Dan. He was such a breath of fresh air. I was giddy and in love. You can read all about how we met here. It was such an exciting time in our life. I graduated from design school and landed my first job as an Interior Designer. It was for a small design firm that specialized in hotel design. I was excited that I finally had a “real” job and that I found the man I was going to marry. 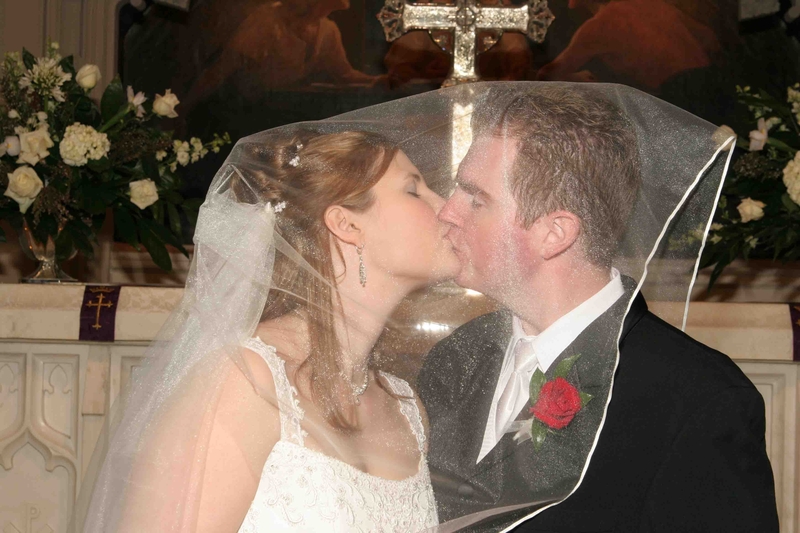 Dan and I married on March 19th, 2005. We moved into a modest townhouse, adopted a pup and began our life together. We said that we wanted to travel before we settled down and had kids, so we did just that. We traveled all through Europe, taking three trips and two guided tours. We also took two trips to Hawaii, visiting Maui and the Big Island. We had a great time exploring together, and learning more and more about each other, other cultures, and this beautiful world we live in. In October 2008, we found out that we were pregnant, but sadly it didn’t work out. Fortunately, only a few months later, we found out that we were pregnant again and this time, it stuck. Nine months later, our first bundle of love, Parker was born. What an exciting time in our life. Dan was traveling full time, and I was working as a designer at a local client Verizon, but I quit my job to stay home. The hardest, but most rewarding job in the world has been my job as a parent. It’s so much more challenging and exciting than working my old 9-5 in the corporate world. I was so excited to be a Mom, that I wanted to be one again soon… so nine months after Parker was born, I found out we were expecting again. In March of this year, Mason was born. What a long and exciting journey it has been. I’m so glad that God didn’t give up on me, and held my hand through this and I’m thankful for family and friends who have seen me through the hard times. I’m also thankful for my husband who has believed in me and encouraged me along the way. I know many chapters are still to be written, and I’m excited to see what else is in store for me, as I travel through life’s journey…learning and growing and hopefully opening myself up to what God has in store for my life. So far being thirty hasn’t been so bad, and I intend on embracing it to the fullest.